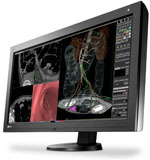 Hakusan, Japan July 1, 2011 – Eizo Nanao Corporation (TSE: 6737) today announced it will launch the RadiForce RX840, a new 8 megapixel super high resolution diagnostic color monitor for versatile medical imaging. In the medical field where filmless imaging is rapidly growing, hospitals need to handle increasing numbers of image types and information volume. Within its 36.4-inch screen size, RadiForce RX840 is capable of displaying 8 megapixels (4096 x 2160 native resolution) of information volume without the obtrusive bezels. The monitor gives plenty of room to display all necessary imaging applications or windows at once. The RX840 is the first EIZO medical monitor to incorporate an LED (light-emitting diode) backlight. Unlike conventional CCFL (cold cathode fluorescent lamp) backlights, LED backlights deteriorate more slowly and thus the monitor offers a longer service life. The warranty specifies that the monitor will maintain a brightness level up to the recommended figure for calibration of 400 cd/m2 for 5 years or 25,000 hours. This ensures stable and reliable performance that is needed for diagnostic monitors. The RX840 features EIZO's unique Hybrid Gamma function which automatically distinguishes whether the displayed images are monochrome or color even within the same application. It displays the monochrome images in DICOM Part 14 standard adjusted mode and the color images in gamma 2.2 adjusted mode. This expands the usability of PACS (Picture Archiving and Communication System) applications by ensuring that color and monochrome medical images are optimally displayed simultaneously. The RadiForce RX840 utilizes a panel with almost no noticeable color shift when viewing the screen from an oblique angle. The wide viewing angles of 176 degrees, allow images to be viewed simultaneously by several people. The RadiForce RX840 houses an IFS (Integrated Front Sensor) within the front bezel to measure grayscale tones according to a user-determined schedule and calibrates to the DICOM Part 14 standard. By installing the bundled RadiCS LE software, the IFS and RadiCS SelfQC function allows QC tasks to be performed by the monitor itself even when the connected workstation is switched off. This dramatically cuts monitor quality control workload and maintenance costs. Mass production of the RadiForce RX840 is scheduled for November of 2011. Availability varies by country so please contact the EIZO subsidiary or distributor in your country for details.